This toolkit is based on the experience of the Canadian At Home/Chez Soi project that used the Pathways to Housing model of Housing First for homeless people with mental illness. While the toolkit has a mental health focus because it is based on the At Home/Chez Soi experience, it is applicable to and can be adapted to other segments of the homeless population (e.g., youth, families), many of which also experience mental health challenges. We recognize that the Pathways to Housing model of Housing First is but one model of housing for homeless people, not the only model. At the same time, we note that the Pathways model, unlike many other housing models, is based on extensive research, including the At Home/Chez Soi project and several rigorous studies conducted in the United States. Moreover, the Pathways model of Housing First is being implemented across Canada, the United States, and Europe. In Canada, Housing First was adopted as the solution to homelessness in Calgary and it has now been adopted in many other Alberta cities, including Edmonton, Red Deer, and Lethbridge, which have been successful in reducing homelessness. Finally, Housing First is being actively promoted by the Homelessness Partnering Strategy of Employment and Social Development Canada. 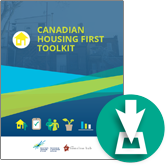 The toolkit was developed to assist other Canadian communities that are interested in adopting the Housing First approach. Primarily based on the experiences of the At Home/Chez Soi project, we have assembled tools and resources that are practical and user-friendly for groups and communities interested in the Housing First approach. We expect the primary users of the toolkit to be practitioners, planners, government policy-makers, researchers, and people with lived experience of homelessness and/or mental health working in the housing/homelessness sector, health/mental health sector, and stakeholders in related sectors. The toolkit provides useful “how to” information based on years of experience that can help community groups and individuals to develop and implement Housing First programs. Finally, the toolkit complements similar manuals developed in the U.S. (SAMHSA, 2010; Tsemberis, 2010) and a recent book of case studies of Housing First in Canada (Gaetz, Scott, & Gulliver, 2013).